This is so "Star trek" I don’t even know where to begin. 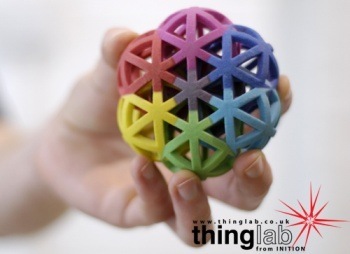 Thinglab are offering a service to take designs generated by your 3D modelling package, and literally "print" them into reality using a specialised inkjet printer. The end result, as you can see from the photo, is an actual, physical model created from your 3D image. How cool is that? There’s a video explaning the process here – basically your model is broken down into cross sections and "printed" a layer at a time, from the bottom up. Even better, complex models with holes in them are no problem so you’re not just restricted to solid outlines. The printer is available to buy, although at £20K (about $40,000 at the time of writing) it’s not really aimed at the home market. You can get a single model created using their service from £250 upwards though.